Armored Warfare release its new Christmas expansion – Caribbean Crisis which adds a new game mode called ‘Special Operations’. This mode consists of a series challenging PvE missions which connect to an engaging overarching narrative. The first of these challenges will feature three new co-operative missions, set around the Panama Channel. The special operation will introduce a brand-new antagonist and enemy faction to the lore of Armored Warfare. By actively taking part, players will be able to shape the future of the story and lore of the game. Grassy Fields PvP Map: The new PvP Map Grassy Fields, is set in the open countryside of eastern Croatia and is ideal for armored vehicle operations. It offers numerous flanking opportunities as well as positions from which accurate fire can be delivered upon the opponent. Don’t admire the beauty and serenity of the environment for too long – the enemy might be lurking behind every tree. Night Battles: Introduced as an exclusive feature for the new Grassy Fields map are Night Battles! The new night fighting game mode will be available to both PvP and PvE versions of the map. Players can use their vehicle’s night vision devices and thermal optics to master the art of warfare in the darkness of moonless nights. Limited visibility will make spotting difficult, improving the importance of reconnaissance and battlefield awareness. Epic Medals: Among further additions and improvements, all new ‘Epic Medals’ will be introduced in this update. Epic Medals are awarded for truly notable achievements such as scoring a certain number of kills in a single match or spotting more than nine enemy vehicles to name but a few. 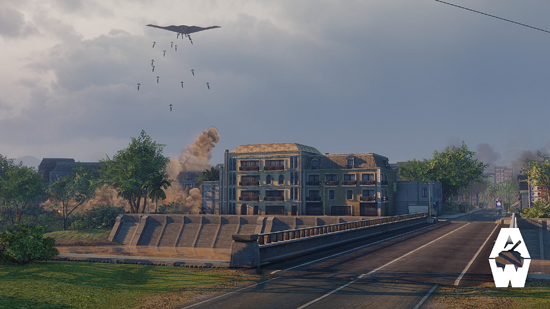 AI in Low-Tier PvP: To improve the gameplay experience of Armored Warfare on the lower tiers and help new players learn the basics of PvP combat, AI controlled opponents will be available on Tier 1 and Tier 2 battles. The AI opponents will join and complement each team and will behave like actual players, trying to not only kill the enemy, but also to capture bases. New Dossier UI: The Dossier has been overhauled to match the new User Interface visual design of Armored Warfare. Armored Warfare is a free-to-play massively multiplayer online tactical military game that puts the player into the world of modern warfare. In Armored Warfare, players get a chance to try the most powerful tools of destruction invented by mankind – from modern main battle tanks to scouts and wheeled vehicles. Using modern defense systems like anti-missile protection and smoke grenades, along with various types of armor and ammunition, players can jump into fast paced battles both in PvP mode and a vast amount of PvE missions.